Ask fellow campers about "Turkey Swamp Park" and nearby attractions. We have a 36 foot class A motor home. I had no problem getting in or out. Yes, it’s tight, but still easy if you go slow. My site was MUCH bigger than most places I’ve stayed. There is a great playground for kids, clean bathrooms, nice trails, and even a free hayride this time of year. We went to Allaire haunted village which was a lot of fun. Only “warning” is that the fresh water spigots are far from the rv site. You’ll need double the hose you normally need. Other than that.... great time and great site We camped at Turkey Swamp Park in a Motorhome. Bring extra fresh water hose. Visit Allaire. Surprisingly very nice campground. Lots to do with regards to the lake: fish, canoe, row boat, kayak and trails. The roads are tight but doable. Surprised that my 34 foot class A fit without a problem. Sites are a nice size plenty of room. There is a 30 and 20 amp hookup. No sewage on site but there is one dump site for the camp ground. There is a table and fire pit on site. Fire wood can be purchased for $10 or you can bring your own. There are three play grounds at the park, on at the camp grounds. Oh and lots of sand. Really neat place will stop by again. We camped at Turkey Swamp Park in a Motorhome. Nice campground, tight roads but we did OK in our 34' class A. Large site B8 though it leans a little. Lots to do, we rented kayaks and rowboat for fun, lots of trails to walk and fishing. Will definitely return. Can't do it all in a weekend! Oh yeah - Gonna need a lot of water hose I used about 90 feet. They have dump station on C loop We camped at Turkey Swamp Park in a Motorhome. Sites are very large, but very tight. Great for tenters, not so much for larger RVs. The pull-through sites are curved and many of them are between large trees. Took 45 minutes to maneuver out of my site between the trees with only inches to spare. Also, all the sites on the left side of the road have the hookups on the wrong side so you have to run cords under the front of your trailer. Water hookups are about 50-75' away from the electrical hookups. We camped at Turkey Swamp Park in a Travel Trailer. Very wooded sites. Depending on where your hookups are located, you might need extra water and electric hoses. We were in site B 10 - very nice, clean site. We did not take advantage of the water activities or the archery range. We did take a short hike on one of the trails. We did not use the showers. The rooms were clean. We were not looking for any planned activities, just wanted to get away from the house for a weekend. This campground is only about 30 minutes from our home. We will be going back. We camped at Turkey Swamp Park in a Travel Trailer. Great county park. Lots of trees and wonderful trails along with a small pretty lake. Rangers were very nice and drove through the campsites regularly. Sites spaced out very well. Needed an extra hose to reach the water. Site mostly level. Watch out for the tree limbs! We camped at Turkey Swamp Park in a Travel Trailer. This is a rustic campground. Two sites share a water spigot so you need 75 ft or so of water hose. It was near about full on a Saturday but pretty deserted by Sunday afternoon. It was tight for a 38 ft motorhome to get into the site. No satellite TV or over the air with an internal antenna. We camped at Turkey Swamp Park in a Motorhome. Saturday night asphalt racing at Wall Stadium or New Egypt for dirt. Try the Amazing Escape Room for a new experience. It is the number 1 thing to do in Freehold according to Trip Adviser. A Super Wal-Mart is 4 miles away. Very glad to have discovered this park. My daughter lives in Aberdeen NJ and I'm glad to have a place to park the RV while visiting her. This park has a marvelous network of trails through the pine barren woods and around the pond. There are playgrounds and beaches (although while I was there it was a little chilly to swim). The campsites are well separated and quite large. The water hookup is shared so if you want to leave it hooked up you will probably need a second hose. There is no sewer at the campsites but a good dump station is available. The place gets really busy on the weekends, but you get it to yourself during the week. 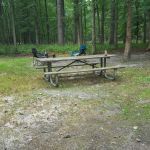 We camped at Turkey Swamp Park in a Motorhome. We arrived after a good rain and our site was pretty soupy. We saw some with standing water. All sites are "parallel" pull-through which put our rig, particularly the awning, in danger of being snagged by trees. The site was not level. We camped at Turkey Swamp Park in a Travel Trailer. Good local spot run through county parks. Sites have good spacing and are pull through. Dump station in seperate location. No pool, but there is fishing, playground, and other activities. We did one night stay. Great Adventure is not far away. We camped at Turkey Swamp Park in a Motorhome. Turkey Swamp Park is a Monmouth County park in Freehold, NJ. We wanted to be able to visit New York City as well as Trenton and this location allowed us to do that. There just aren't many options for RV parks close in to NYC. The campground is heavily wooded which was welcome since it was quite hot when we were here. The driveways are sand which is nice since it does not give rise to dust. The sites are dirt. Most of the sites are the "pull along" style that sort of make a small detour from the roadway. The sites are very long but the connections for water are located at the end of site, so two water spigots, one for each site. So you'd better have a long water hose, or two hoses. In addition, we had 30amp electric. No sewer but there is a dump station. The bathrooms are very nice and clean. We paid $40 per night. We camped at Turkey Swamp Park in a Motorhome. All pull thru sites. Easy in and out. Sites are dirt, but level. But when it rains it is very muddy. They only have electric and water, and you share the water with another site. Good thing we had two hoses because the water spigot was almost 75 feet away. We wouldn't stay here again unless we really needed to be in this specific area. We camped at Turkey Swamp Park in a Motorhome. A nice park, quiet, open. Sites are good size. Water is a bit far, bring an extra hose. Showers were OK, not spotless. Our 2nd time here and it fits the bill. Great place to get away and free beach and parking at county park, 45 min away. Very nice beach. 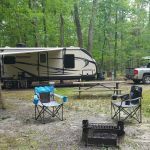 We camped at Turkey Swamp Park in a Travel Trailer. Several places, eat, shop, movies, groceries near by. Good dinner at Moore's. The beaches. As the previous reviewer said, this is a real campground experience. There are lots of activities at the park, but the campground isn't that great. The roads are windy getting in. The sites are C-shaped pull-thru, but depending on the side of the road you are on, your door may open right out to the road. People would pull in the wrong way on a one-way, narrow road to get their door to open on the other side. When it rained, we had a lake at our door. There were several other sites like ours. The water hookup is a long ways away from the camper. The water is shared with another site, therefore it is at the entrance to once site and the exit to another. You definitely need extra hoses. There were too many trees to be able to get any satellite coverage. No sewer, but a dump station was available. The laundry machines were ok, but it only took tokens which you had to buy ($3.00 per machine) at the office which isn't open all the time. There seemed to be lots of partiers and it was noisy on weekends. We would not stay here again. We camped at Turkey Swamp Park in a Fifth Wheel. 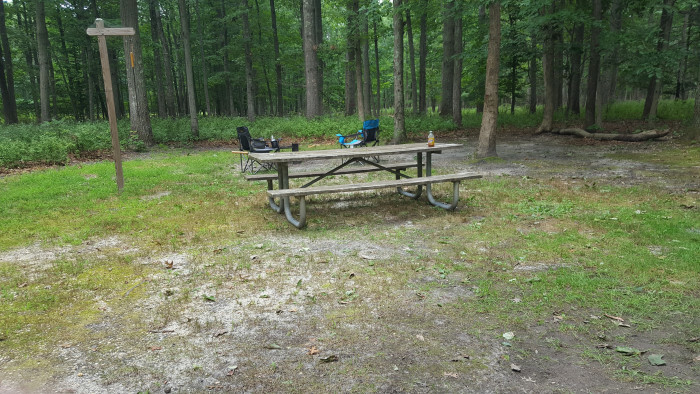 Best government campground in New Jersey. The park is owned and run by Monmouth County Parks and Recreation. The sites are huge and heavily wooded. The rustic style structures--bath house showers, laundry and pavilions--have a wilderness feel. The park makes you feel like you are in a wilderness as it's huge, over 2,000 acres. It includes a 17 acre lake with a boardwalk and marina for fishing canoeing and paddle boating (small fee). Over 15 miles of hiking trails and a well maintained archery range. There are also three cabins for rent. Each of the 64 sites has water and electric hookups but bring a long hose, the spigots can be over 50 feet away from your RV. There is a central dump station but no individual ones at the sites. Despite the lack of pads, the site setups are sweet. They all include a table, lantern stand and a large heavy steel fire pit ring with a built in grill that can be adjusted and folded upward when just burning. The sandy soil may track into your camper but it doesn't retain heavy rainfall as it absorbs it very quickly, thus the sites never stay wet for long. The sand roads can be narrow and windy in spots but they are excellently maintained and always flat with no potholes. Firewood is available and trash picked up daily. The park rangers do have police powers so the grounds are quite safe. They are always very nice and accommodating. They do enforce their no fires rule after 11pm but often times will let you extend it later. 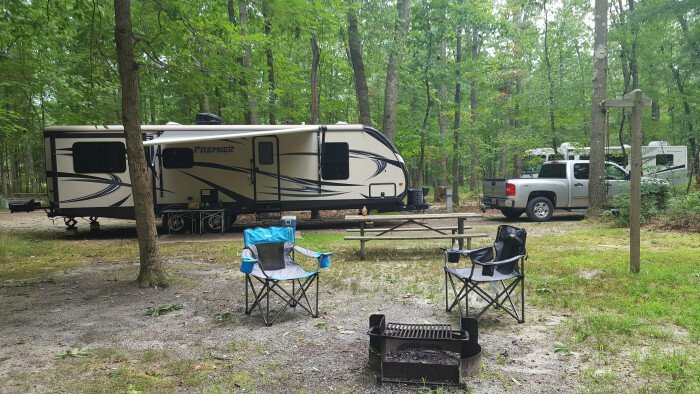 We camped at Turkey Swamp Park in a Motorhome. Battlefield Park, site of the battle of Monmouth, the pivotal battle during the revolutionary war where the British chose to retreat over losing after a day of fighting. Six Flags Great Adventure, site of the worlds tallest and fastest roller coaster. Battlefield Park, site of the battle of Monmouth, the pivotal battle during the revolutionary war where the British chose to retreat over losing after a day of fighting. Raceway Park drag racing. Six Flags Great Adventure, site of the worlds tallest and fastest roller coaster. We did not leave the park. Nearby Freehold Mall, plenty of restaurants and shopping. Very close to Great Adventure and Outlet Shopping. Six Flags Great Adventure, Monmouth Battlefield, Wemrock Farms, Delicious Orchards, and Eastmont Farms are close by. You can easily day trip to a lot of NJ from here as you are close to Rt9 and Highway 195. The Battle of Monmouth State Park is only about five miles away and is worth visiting with their exhibits, videos, trails and picnic areas. Are you affiliated with Turkey Swamp Park ?